I would like to make a complaint about numerous journalists over the past two days using the phrase ‘Mediscare campaign’. As a supporter of Australia’s universal healthcare system, who has watched the Liberal government first under Abbott and now under Turnbull chip away and chip away at Medicare in their ideological quest to turn it into a user-pays healthcare system, and who has been aghast at secret plans to privatise a little bit here and there and no doubt a slippery slope to turning the whole thing into a profit-centre, I do not appreciate your journalists’ inference that Labor’s campaign to ensure voters are aware of the Liberal government’s Medicare policies is nothing more than a ‘scare campaign’. We all know what scare campaigns are. They are fact-less, politically opportune, cynical attempts to use fear to win votes. By calling the ‘let’s save Medicare’ campaign a ‘Mediscare campaign’, not only are you overstepping the line between reporting the news and editorialising in favour of the Liberal government, you are also undermining your very important job of providing voters with a true assessment of the facts this election. The Labor Party has every right to tell voters what a Liberal government plans to do to Medicare and has every right to point out that the Liberal Party has always been an enemy of Medicare. Last election, the Liberals campaigned on a promise of ‘no cuts to health’, a lie blatantly exposed in the 2014 budget when the GP co-payment was sprung on us. Since you won’t do your jobs and tell voters the facts, and instead you write-off Labor’s campaign to protect Medicare as nothing more than a scare campaign, I am making this official complaint about your conduct. I also note that you never came up with some pithy little slogan or catch phrase to undermine the Liberal Opposition’s un-factual scare campaign about the mining tax, or the Carbon Price. Nor have you mentioned the current Liberal scare campaign which accuses Labor of ‘putting people smugglers back in business’. You seem to spend all your energy trying to trick politicians into gotcha-moments and would like to think of yourselves as players in the political system, rather than doing your jobs and just reporting what is really going on. There is little credibility left in your organisation. Each time one of you says ‘Mediscare’, you get closer and closer to the zero mark. Hear hear! The ABC has been noticeably pro-LNP in this campaign – I can’t help thinking Murdoch’s pal being put in charge might be the cause! That you Victoria for pointing this fact out about the ABC involvement by using MEDISCARE against Labor attempt to warn Australia about the evils of this Turnbull lead federal government. Well done Vic. Well caught …. a death by a thousand cuts has the same end result as a sudden massive move to completely privatize the Australian Health system. It is to always be remembered that that it took from 1912 to 1991 (79 years) for the Commonwealth Bank of Australia (CBA) to be privatized. That institution was opposed by the equivalent of the Liberal Party from its inception and over those 79 years the original concept was so diminished and hacked at that (unfortunately) it was a Labor government that allowed its final demise. The LNP thus has a very well-proven scenario to deal with national institutions which fundamentally they oppose. And they are so very patient. Our A B C has been corrupted by journalists that used to have all their facts checked and showed no bias. I presume some on the board as well as Ms Guthrie a friend of Murdock have created this change. A broadcaster that we all were proud of has been destroyed and it is extremely sad. 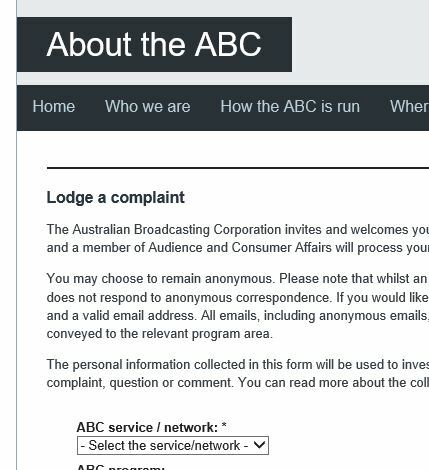 Correct again Victoria, but it is a waste of time contacting the ABC because as I have found out on numerous occasions they won’t get back to you if you are any way critical of the lnp liars. And after watching Leigh Sales pathetic screeching biased questioning of Bill Shorten last night the ABC is just another arm of the lnp propaganda unit. I have given Leigh Sales the big flick overboard some months ago now. Several ABC journos are coming up GRUBBY AS… Stuart Littlemore tried to warn us of the IPA 15 yrs ago. IPA has sinister plans for the ABC, to break up and put each function out to tender. It is said that Michelle Guthrie is IPA! That doesn’t surprise me the least. I think the IPA was more corrupt than any builders workers union and the IPA gets away with it.